Take a look at our 2015-16 Annual Report for a look back at what we were up to over the last year. 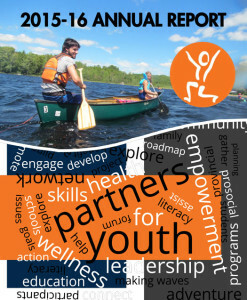 This year marked out 22nd year of operations and, as an organization dedicated to supporting and helping youth at risk in New Brunswick, we continue to expand our reach. We expanded our middle school program to reach more students. We continued a three year project on human trafficking across New Brunswick. Finally, we expanded our youth in action for mental health project into more high schools across the province. All of this work and so much more could not be accomplished without our dedicated volunteers and staff. They continue to outperform and produce high quality programs for youth and youth at risk, and we are so very thankful and grateful for their work. Our board of directors is a wonderful and committed group of individuals who all support the mission and vision of this dynamic organization. Our board president, Jody Gorham, has either served as director or president for several years and continues to provide great leadership. Jody works alongside our staff and CEO and has significantly supported the expansion of the organization over this time. Of note — directors Larry Johnston, Ross Creelman, and Mike Joyce have given a decade of their time to the PFY board, and their continued involvement is appreciated. Our funders continue to support our commitment to youth and youth at risk, and we are grateful for such wonderful partners in this work. We have much to be thankful for as an organization, but we must continue to do more to support and engage youth and youth at risk across this great province and beyond.